We are Friday the 13th! A symbolic date for the symbol-minded, bringing bad or good luck depending on your inclination or mood. While no one is really sure where the belief comes from, it is well entrenched in Western culture and even has its own phobia called paraskevidekatriaphobia (from the Greek, "paraskeví" = "friday" and "dekatreís" = "thirteen"). As a matter of fact, , "it's been estimated that $800 or $900 million is lost in business on this day" according to the Stress Management Center and Phobia Institute in Asheville, NC. Yet, rather than staying in bed or putting all their lifesavings in lottery tickets, many see in Friday the 13th a huge opportunity for marketing purposes especially since they don't come around that often, the next occurrence being in May, 2016. Marketing is really heavy when Halloween comes around, while Friday the 13th is still vastly untapped. Which is great news for you as you will have many more occasions to celebrate the latter, and face much less competition. How can you make the best of Friday the 13th? 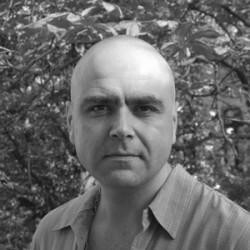 What successful campaigns can you get inspiration from? 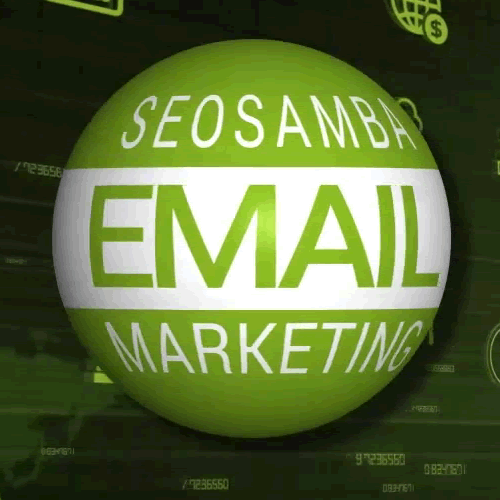 SeoSamba give you a few hints and tips to turn bad luck around to your advantage. And for those who scoff at the idea, here is a quick list of what a well-rounded Friday the 13th marketing gig can do for you. The very first and most important thing regarding Friday the 13th is to know that it's happening! And this is not quite self-evident as it seems. Just because you know and care doesn't mean others do, whether it's your customers or your marketing staff. Or maybe you really, really do not care to the point where you don't even notice, and that could be a problem too. In Spain, the special day is Tuesday the 13th, not Friday, and in Italy it's Friday the 17th. 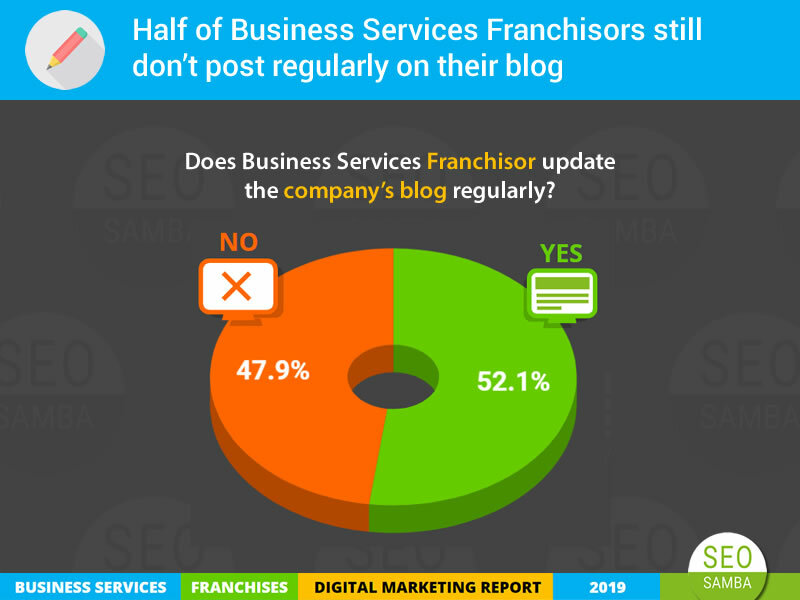 So make sure you know about those dates wherever you are marketing your brand. This has some interesting implications, as pointed out by a Block and Kramer study showing that people are willing to pay more for the same item to avoid an unlucky number! For instance, Taiwanese are willing to pay up to 50% more for a pack of 8 balls of tennis than for a pack of 10, just because 10 is a bad luck number. 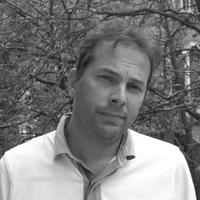 According to Kramer, it's important for business owners to be aware of any superstitions held by their target market. to both capitalize on it and avoid blunders. 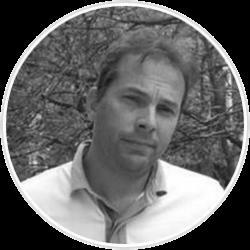 That being said, you can read on to find out how to turn Friday the 13th into a great opportunity both for you and your customers or audience. 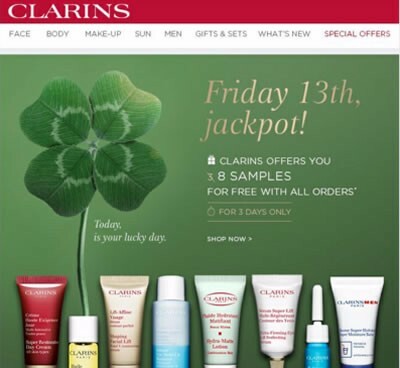 If anything else, you can turn any special offer - even totally unrelated - in a special "Friday the 13th" offer, like Clarins did in the following example. For most people that believe to some degree in the Friday the 13th superstition, the day is a synonym for bad luck. 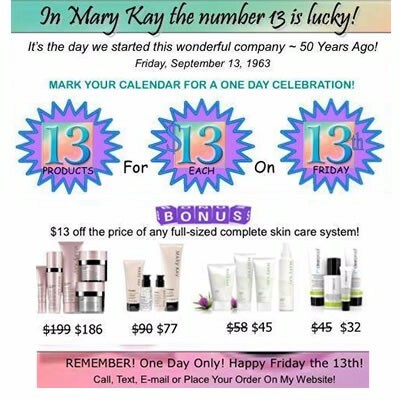 Yet, 13 is a lucky number for many others so why not make Friday the 13th an actual lucky day for your customers? 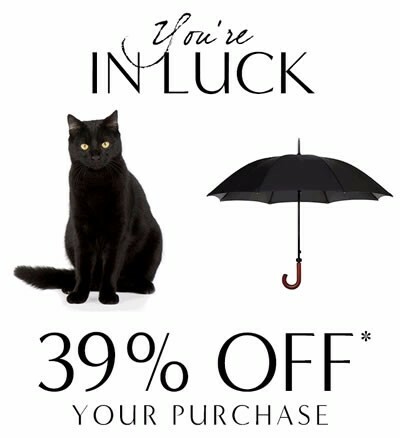 Whether you are just organizing a day sale and tell your customers how lucky they are to benefit from it, or simply organize some kind of sweepstakes, there are many ways to make Friday the 13th a memorable day for your customers, just like in this ad from Banana Republic. As marketing people know, any special occasion is a good excuse to communicate with your customers, especially if you're smart enough (you are, aren't you?) to send a message that has both meaning and value. This is exactly what many businesses do when they send you a personalized gift or offer on your birthday. In this case, just about any special offer will do in terms of value, so as long as you find the right angle that resonates with Friday the 13th, chances are that your operation will perform much better than on any other random day, just like furniture store Johan's. A pretty obvious way to leverage Friday the 13th is to play on the number 13. In truth, we wish we could have given you thirteen Friday the 13th-related marketing tips for to make our blog title even more potent. We didn't, but you still love us, right? A good example is this campaign from the South Park online boutique who offered 13% off. If you don't feel like giving 13% off your entire catalog just like South Park did, there are many wore ways to play with numbers. A simple one is to take 13 of your products and put them on sale. The more luck-related they are, the better (like umbrellas, mirrors, etc.) but even if they aren't that shouldn't make your customers less happy about it. Plus, who's to stop you from mixing it all up, just like beauty boutique Mary Kay did. Just because "13" is the obvious thing to play on, that doesn't mean you're stuck with numbers. Words work just as well. There are many wordplays you can have fun with to give a little boost to your "Friday the 13th message". 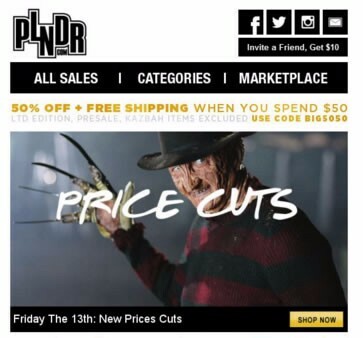 Fear, luck, superstition and everything related is an opportunity to create a catchy slogan for your special offer, from "slashing prices" to "killer app" or "price cuts" in this example from the PLNDR website. Who in his right mind would dare launch a brand new product on Friday the 13th? Well, you, of course! Friday the 13th can be a great date to launch a product as you can find many ways of marketing this brave stunt, and send the message that your product is so good just nothing bad can happen. On a more serious note as we stated before, Friday the 13th is a Western culture thing. So nothing stops you from using Friday the 13th in those countries for a launch date, you will get the marketing kick with no bad luck is sight. 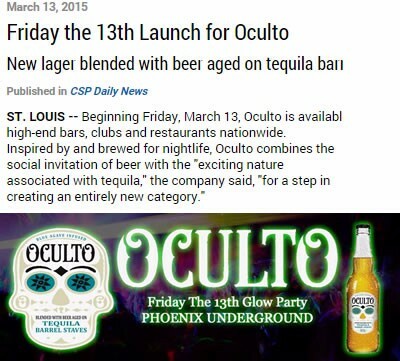 Works even better with the right product, just like the beer Oculto did. 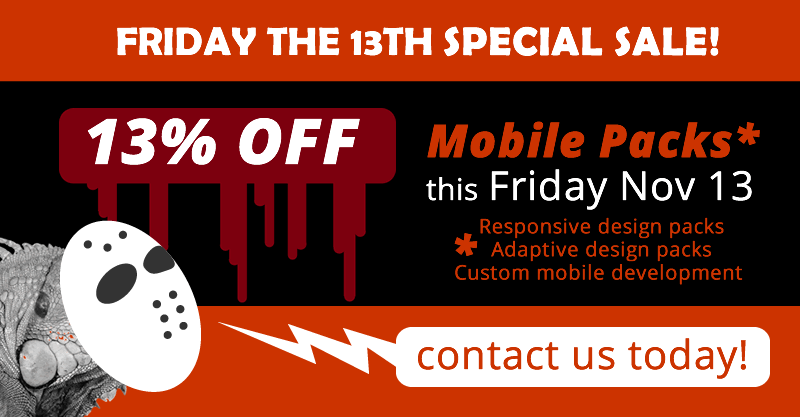 If you decide to make Friday the 13th a special marketing occasion, you might as well go all the way and make it last. How about a countdown operation? You can have 13 crazy days of sales, featuring one big promo each day before the dreadful date when all these items go on sale. The buildup and anticipation can be a great attention-grabber, just like Amazon does once in a while. 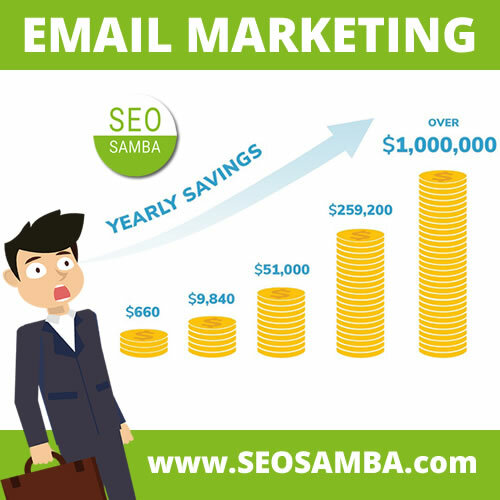 This is also an efficient way to build anticipation and excitement, reinforce engagement, boost your email marketing, and give almost two weeks to visitors to register or respond to a call to action in order to benefit from your super Friday the 13th promo. 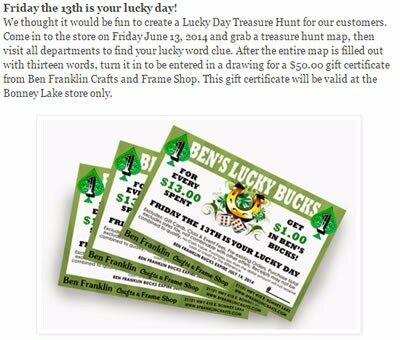 If part of your business is brick-and-mortar, imagine how fun a Friday the 13th treasure hunt could be. You could for instance hide certain items in your store or the park nearby, and challenge customers to find it and bring it back to the store for a free prize. As an added bonus, this can be a great way to boost your social engagement on a local level, for instance by giving helpful clues on Twitter, then on Facebook, then on Pinterest etc. This sounds like a fun idea to do some smart marketing around that otherwise dreadful date, whether to launch a new product (read above) or even, why not, a store opening! In Scotland, "fud" is slang for a woman's intimate parts, but for the rest of the world 'FUD' stands for Fear, uncertainty and doubt, a covert scare tactic used in sales and marketing. It usually thrives on consumers' fears to provoke a sale, or tangentially attack a competitor. We would not advise any business to use FUD as a viable marketing tactic, as it usually backfires against its perpetrator especially in this social media age. What you can do instead is fight it with humor, for instance by posting a funny cartoon on your social networks, or taking a stab at a FUD-filled statement about your industry, business, or products. If there is one area where you pretty much cannot go wrong, it is that of charitable actions. If you'd like to show your brand in a great light, how about making Friday the 13th the occasion to make a donation to a worthwhile cause? For instance, you can make a $0.13 donation (or $13, or 13%) on every purchase in your online store during the entire day, or help out 13 different charity organizations. 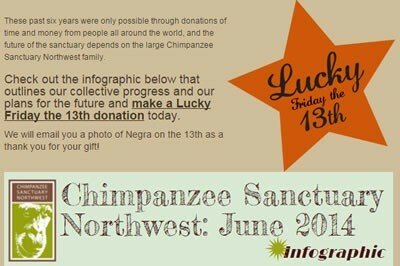 There are even donation opportunities on that particular day, such as this one for a chimp sanctuary. Seriously, does anyone not like chimps? Did you miss the opportunity for a casual social post on Halloween? There is your chance to make up for it. Be part of the great Friday the 13th gig by sharing some scary story or writing a non-commercial blog post. Even better, how about putting together a playlist of your 13 favorite songs on Youtube and share it? Granted, this won't boost your sales by 10% overnight, but at least you're doing something to stand out from the crowd and get away from the business side of things, if just for a day. Here is a clever playlist with Friday the 13th related songs, starting with the obvious "Superstition" from Stevie Wonder. 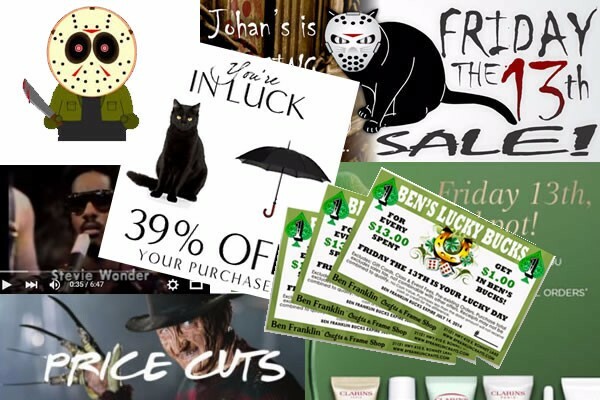 You may not be prepared for a special marketing campaign centered on Friday the 13th but some of the above ideas are too easy to implement to be ignored. 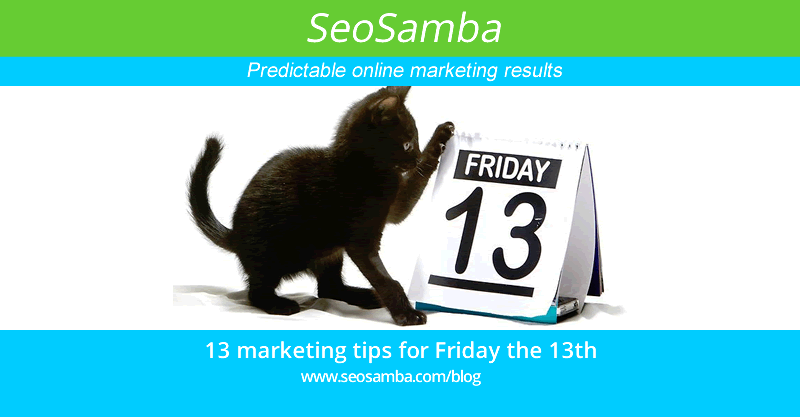 By promoting Friday the 13th you are driving your audience to think that luck and superstition have no impact on your business operations, and that you can turn a seemingly negative event in a positive one. So why not go all the way and develop a full-fledge campaign using all the tips and tricks listed here, and more. This seems like a great opportunity, make your customers happy as well as getting your staff all psyched up about a fun and original activity. And don't forget, Friday the 13th are somewhat randomly dispersed throughout the calendar, which is an awesome way to stand out from competitors sticking to age-old and boring holiday promotions (which incidentally you can do as well anyway). Indeed, this can be the occasion to make little Stevie wrong, as Friday the 13th can do "wonders" for you marketing strategy, as when you believe in things that you don't understand, Superstition might very well be the way!